Another one from our visit to Bedford on Monday. Lovely shot. The bridge is beautifully lit. Lovely photo of the bridge in the late evening light! We have an Ouse street Oamaru called after your river! I like all the little details in this that make the whole image work; the twinkly lights, that lovely curved balustrade and the finale of the bridge. Wow, the dreamy tones and great composition, straight out of the fairytale! What stunning color! Just catches your breath - super composition of all the elements. What a great nighttime capture. 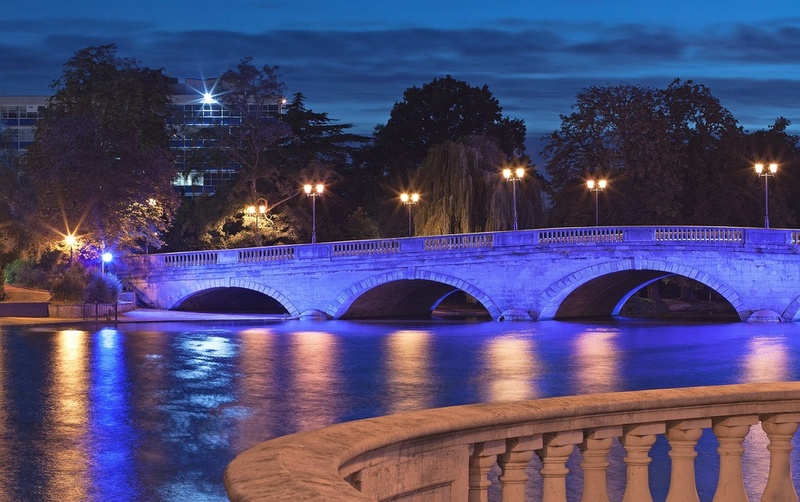 Love the way the lights turn the bridge blue; the wonderful reflections of the lights along the bridge in the water; the beautiful trees and sky in the background and how you can see under the bridge to where it opens on the other side. The whole picture just screams "Fav" to me! A beautifully composed night shot. Gorgeous! That water looks almost icy. Beautiful and smooth colours. The whole compostion is very pleasing. What a beautiful shot! I love the effect of the long exposure on the water. The purple tones on the stonework and water is great, too. Wow, this is so spectacular. Fabulous capture and detail. Absolutely stunning Alison! The colours and lighting are so beautiful. Love the reflections. Gorgeous capture,Alison,lovely lighting!! I've only seen it in daylight.FAV!! A beautiful image. Love the blue, all the reflections, the lights, that lovely shaped balustrade and that far light flash. Two people have already described all the great things about it so well. Fav. Wow - just... wow. I love the minimal palette of colours here. Excellent! It does have a romantic feel. Fav!